Today I found out American “buffalo” are not actually buffalo. The American “buffalo” are actually bison. Specifically, they are “Bison bison”. The only true buffalo are the Asian water buffalo and the African buffalo. The American bison are actually very closely related to the Wisent, which are European bison. American bison are also somewhat closely related to cattle. In fact, they can interbreed readily with cattle, something that buffalo have never been observed to do. Even in lab experiments, buffalo-cattle embryos have failed to ever reach maturity. So why do we call American bison “buffalo”? There is some speculation that this simply came from Europeans associating them with African and Asian buffalo, giving them the same name. But this seems unlikely as American Bison strongly resemble the European wisent bison, much more so than the African or Asian buffalo. A more likely scenario is that they were named such because the American “buffalo” were primarily prized by Europeans for their hides. “Buffe” or “bufle” were commonly used as names, at that time, for any animal that provided a good hide for buff leather. Another common myth surrounding American Bison is that there were massive herds, before the “white man” came to America, on the scale that Americans eventually encountered them at. In fact, evidence suggests that the Native Americans kept the bison populations regulated by various means. After the European diseases wiped out most of the Native Americans, the American Bison population exploded, becoming the most numerous large wild mammal on Earth until eventually hunted to near extinction within a few centuries after this population explosion. At their peak, it was estimated that there were nearly 100 million American Bison in existence, only a few centuries ago. Before horses and guns were introduced to Native Americans, hunting bison was a dangerous affair, with the bison being quite aggressive and hard to kill. One of the methods of hunting them that the Native Americans would use was to attempt to herd a large group of bison into chutes of rock, which lead to a cliff. They’d then incite a stampede with most of the herd falling to their deaths. The meat and skins could then be easily gathered. American bison were eventually brought to near extinction by the late 19th century. The U.S. army sanctioned the whole-sale slaughter of the bison herds to allow cattle ranchers to establish themselves without competition. This also hurt the Native American tribes who depended on the bison herds for survival. The Native American tribes themselves, now armed with guns and horses, also contributed to the demise of the bison, killing about 1/3 of a million Bison per year in the southern plains alone. The bison hides were also extremely valuable around this same time. One single hide in good condition would bring in about $3. Made into a winter coat, it could bring in as much as $50. A single skilled hunter, such as Buffalo Bill Cody, could kill and skin as many as 100 bison in one day’s work. Around this same era, a common worker would only make a little under $1 a day. Buffalo Bill Cody is estimated to have killed around 20,000 bison in his lifetime. Ironically, he was one of the most outspoken supporters of plans to protect the bison populations through legislation. In the end, President Grant vetoed the bill that would have protected the herds, due to the frequent small wars the U.S. had to fight with the Plains Indians. By getting rid of the bison herds, it took away the Plains Indians primary food and clothing source. American Bison meat is lower in fat and cholesterol than beef. This is largely why efforts have been made to cross-breed them, creating “beefalo”. Wild American bison are one of the most dangerous animals to encounter in the United States. In Yellowstone National Park alone, nearly five times as many people are killed by bison than by bears every year. The bison can reach speeds of up to 35 miles per hour and are surprisingly nimble, making them difficult to avoid if they attack. Because of the cross breeding, while it’s estimated there are a few hundred thousand American bison remaining in the world, only about 14,000 or so of them are pure bison, the rest being mixed with cattle. The “American” bison has only been in America for around 10,000 years, having migrated across the Bering Strait. There are currently around 150 million water buffalo in the world today, with nearly all of them being in Asia. African buffalo are extremely aggressive. So much so, that they have never been successfully domesticated. They also have no common predators outside of humans as an adult African buffalo is fully capable of killing a single adult lion, crocodiles, and the like, making them one of the most dangerous animals in Africa along with Hippos. Lions will occasionally manage to get an adult buffalo on its own and then, together, can sometimes bring it down. But typically the herd will stick together to prevent this from happening. The herd will also attack any threat to any part of the herd. When a distress call is heard from a member of the herd, the buffalo will mob the attacker. African buffalo kill around 200 people a year. No s*** Sherlock. Dear Lord, this is one of my biggest pet peeves. THERE ARE NO BUFFALO NATIVE TO AMERICA. I hope more people will catch on to this fun fact… ugh. You speak the truth my native bother or sister ! they are dumb indeed !!! Have bison always lived in Yellowstone? Yellowstone is the only place in the United States where bison have lived continuously since prehistoric times. We know they lived here in centuries past due to fossils, oral histories from Indian tribes, and the stories of the earliest travelers to this region. Yellowstone bison historically occupied approximately 7,720 square miles (20,000 sq km) in the headwaters of the Yellowstone and Madison rivers. Today, this range is restricted to primarily Yellowstone National Park and some adjacent areas of Montana. ^^ Somebody has watched “Dances with wolves” too many times. 1. The American Bison were called American buffalo before they were called bison. 2. “Buffalo” is not part of the scientific name of either the Cape (African) buffalo or water buffalo..
3. By classification, the water buffalo and African buffalo are members of the same sub-family as bison, each one being a member of a distinct genus, so the three are classified as being equally closely related. 4. Many standard dictionaries use American buffalo as a synonym for American bison. Perhaps the author could clarify what characteristics water buffalo and African buffalo have in common that distinguish them as “true buffalo” when compared to the bison. ..:After the European diseases wiped out most of the Native Americans..” Um….just going to leave it at that are we? Don’t you mean the diseases deliberately sent to infect the Natives? Don’t you mean the mass slaughters that were meant to push the Natives off the land so that it could be stolen and laid claim to by men with better weapons? Don’t mean the authorization and exhortation by government officials to slaughter as many Natives as you can – this as evidenced by the scalping laws that are STILL on the books in 2016 despite many demands to have it removed? To this date if you turn in a Native scalp the government is obligated to pay you your bounty. Go ahead, keep “Whitewashing” history and make sure everyone remains ignorant. buffalo and bison are the exact same thing, just some people call buffalos bison. do you have any proof that American buffalos are actually bison? if so I would like to see and/or hear it. When most Americans hear the word buffalo, they probably think of the American bison. In fact, buffalo originally referred to the water buffalo (an animal that was introduced to western Europe from Asia in late antiquity) and other large bovid animals of Eurasia and Africa. The history of buffalo begins with the Greek word boubalos, “antelope.” The Romans borrowed this word as būbalus, “antelope.” In his work on natural history, however, the Roman author Pliny the Elder notes that the common people used būbalus to refer to the urus, the huge wild ox (now extinct) that once roamed northern Europe, and Pliny considered this to be a mistake. Eventually the Latin word, in its Late Latin form būfalus, became the name for the water buffalo when it was introduced to Europe. Būfalus developed into buffalo in Italian and búfalo in Portuguese and Spanish, and then English borrowed buffalo, with the sense “any of various species of large bovine animals,” from one or more of these languages. How did the word buffalo come to be the popular name for the American bison? When the English first began to visit and settle in North America, it is likely that most of them had never seen the European bison, or wisent, the closest relative of the American bison. The wisent had mostly vanished from western Europe in the Middle Ages, the victim of hunting and deforestation. The English were probably much more familiar with domestic water buffalo, and they may even have heard of the urus, and so when they encountered the American bison, many of them called it by the name of the largest bovine animal they had known before, the buffalo. Already in 1625, English writers were using buffalo to describe the bison of America. If you want to call American buffalo “bison,” knock yourself out. But please don’t pretend it’s more “accurate.” Unless you’re in London, it isn’t and you’re wrong. If you’re in North America, bison are a type of buffalo. Get over it. Ken, I totally agree. We use common names all the time for plants and animals and nobody gets bent out of shape if it’s not scientifically accurate, so why all the fuss about bison vs buffalo? A pineapple is neither a pine nor an apple. Horseradish is not a horse or a radish. A lot of names have regional differences, like the sow bug/rolly-polly/armadillo bug. If you’re a biologist, then you use the Latin genus-species. Otherwise as long as the people you’re talking to know what you’re talking about, that’s good enough. Some sources would be nice, I’m skeptical on a number of points here. 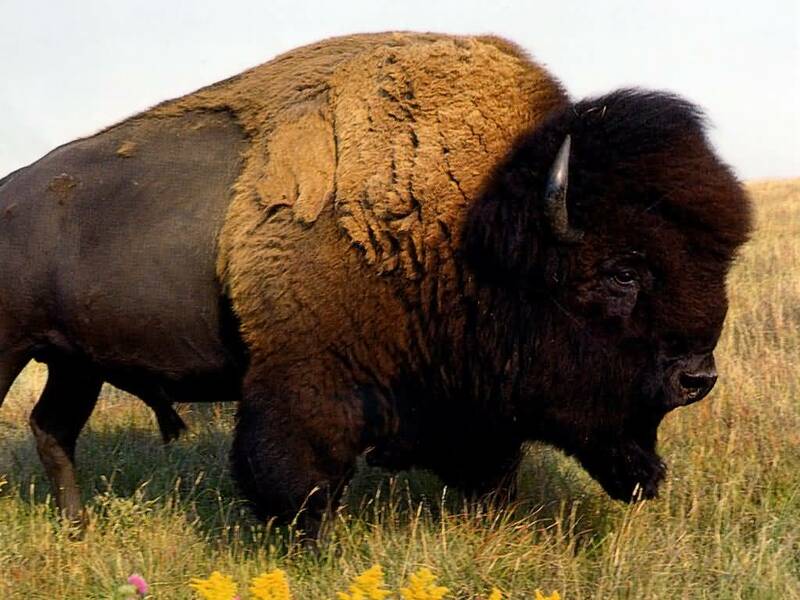 Buffalo (“bison” for the holier-than-thou pedantic) have been in North America for over 130,000 years, having evolved over time to the current species. According to wikipedia, bison antiquus lived in northern parts of North America over 240,000 years ago. I have no idea where the author got the 10,000 year number. Most estimates of the American buffalo population at the peak (early 1800’s) are 30 million to 60 million. I’ve never seen the 100 million number before. 5 people a year are gored by buffalo (genus-species bison bison) in Yellowstone every year, and an average of one injury per year from bear. That’s apparently where the 5-to-1 number comes from, but it’s for injuries, not deaths. I can’t find anything on buffalo deaths. Other numbers from Yellowstone: 8 have died from bears since 1872, 6 have died from falling trees, 19 have died from falling or jumping into the hot springs.